Last month, I took a moment in the midst of a long, stormy, holiday-traffic-filled interstate drive to re-visit Smith Teamaker in Portland, Oregon. 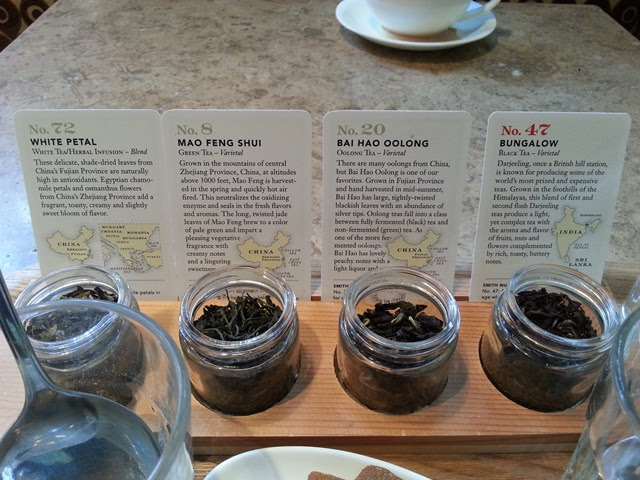 I heard about their tea flights during my initial visit and had to try it for myself. To begin the tasting experience, I chose four teas: White Petal (White & Herbal Tea), Mao Feng Shui (Green Tea), Bai Hao Oolong (Oolong Tea), and Bungalow (Black Tea). The flight includes cupping bowls filled with tea, dry leaf samples, tea data cards, tasting spoons, almond cookies, and rinse water for the spoons. First, I smelled the dry leaves. By breathing out and then in, the leaves are warmed and will provide a stronger, more distinct aroma. Next, I took in the aroma of the tea. Sometimes you'll find quite a difference between the dry leaf aroma and the finished product. Finally, I slurped a spoonful of tea. With a fast slurp (this is one of the rare occasions where noisy drinking is encouraged), the tea will mist all the way to the back of your mouth so all aspects (sweetness, bitterness, and flavor) can come out. I repeated this process for each tea while occasionally taking a bite of cookie to cleanse my palate. My travel companion is not a great fan of tea, but they couldn't resist trying out the flight with me. We had a lot of fun comparing flavors and aromas and discovering likes and dislikes. They enjoyed one of the teas so much that the cupping bowl seemed to spontaneously migrate to their side of the table. 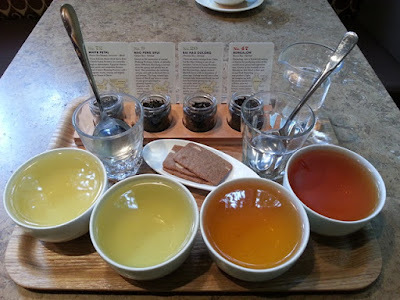 I might have been tempted to initiate a tasting spoon duel in an attempt to reclaim the errant bowl, but I was pleasantly distracted by the other teas in the flight. As always, the Smith Teamaker staff were friendly and knowledgeable. They have my thanks for the wonderful experience!